I recently had the idea of using my heavy painting easel as a typing platform. 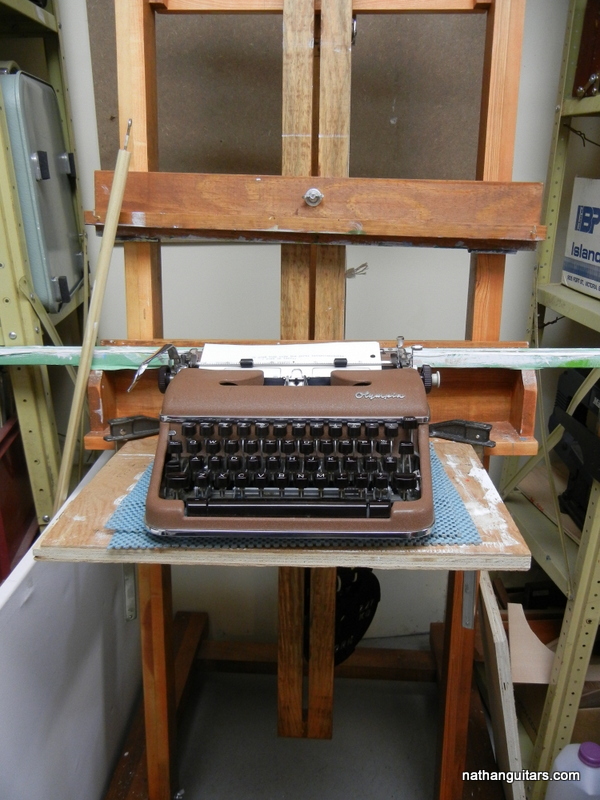 With a piece of plywood clamped to the lower cross member, it is possible to sit a big typewriter on top and position it just above the knees. This posture is far more preferable than sitting at a dining table or conventional desk with typewriter up high. Before this I couldn’t type for long before getting pains in my upper back, but testing thus far indicates the easel will be much better. The result is that I can now circulate all my machines, so I first got out the collection of Olympia SM models. I’ve got one of the 3, 4 and 5’s (Monica version), as well as 3 SM9’s and also a Monica SM9 with French keyboard. A problem with old Olympias is their platens go very hard. 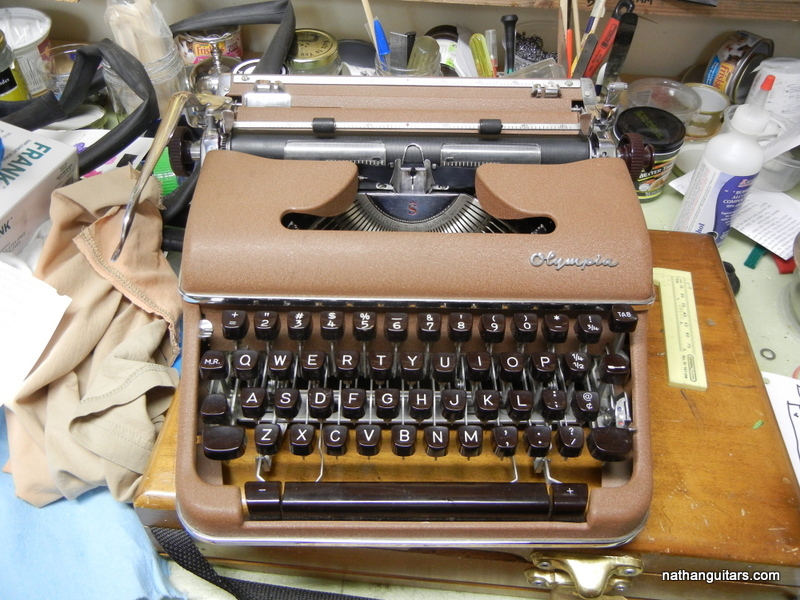 But the SM5 Monica, newest of the old round body styles, had a platen that was much softer than the older SM3 and SM4. I speculate that around 1963 they changed the rubber compound. Monicas being budget models were not full featured and mine had elite type which I didn’t like as much as Pica or 10 character typefaces. 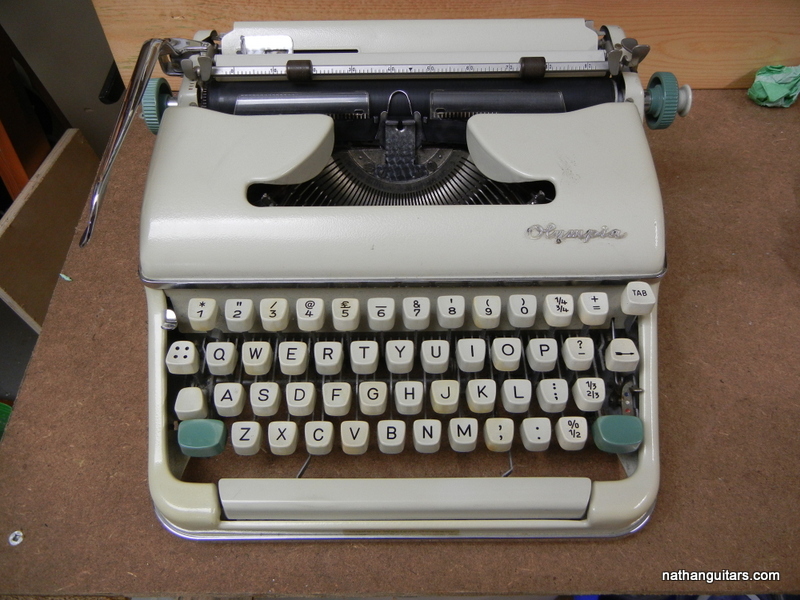 The SM4 was a real beauty however, with cushioned keys, and key set tabs. I have previously attempted to soften hard rubber platens with brake fluid, to no long lasting effect whatsoever. I’ve given up trying this, as it will merely soften the outer few molecules of a platen for a brief period, after which the rubber reverts to its former hardness. But having once again pulled out the platen on the SM4 to apply the brake fluid, I’d become quite adept at this. So I thought – what if the platens of these SM3’s, 4’s and 5’s were interchangeable? I removed the platens from the SM5 and the SM4 to have a look and compare. As it turned out, they were interchangeable, with one caveat: the internal clutches were different, so each platen would have to retain its spindle. 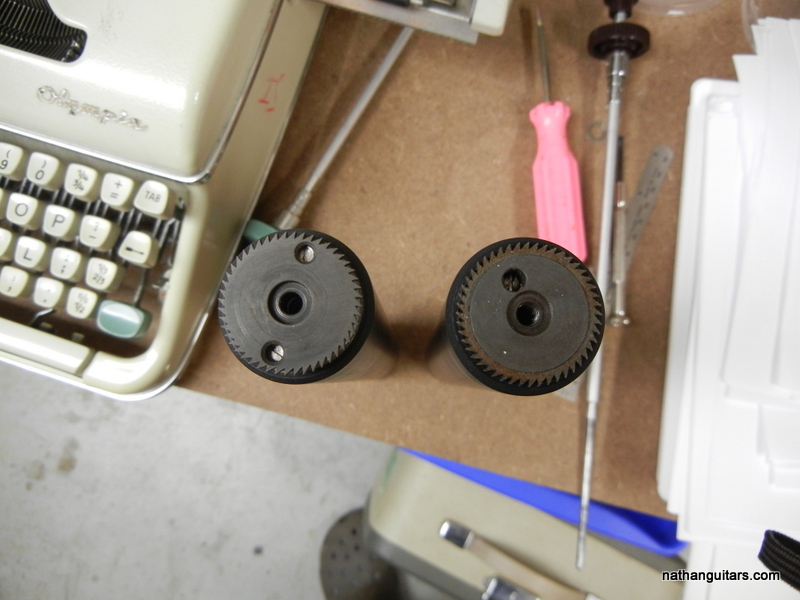 That meant the plastic button on the right hand end would stay with its platen. So the SM4 got a white button, and the SM5 got a brown one. The other knobs were interchangeable. I swapped platens as follows; remove left end knob by loosening set screw; remove right end cover plate screws to allow plate to be pushed aside to access three set screws which hold right knob assembly to spindle; loosen three set screws enough to pull spindle out; between carriage frame and platen end disc there may be a washer which will fall out – this is not really necessary – I reused one but not the other due to differences in clearance; push carriage to far right and pry up right end of platen to extract . Reassembly; I had to swap the end knob so I removed the set screw from the sprung wheel and pulled it off the opposite end (extracted the spindle complete with spring); replace platen and wiggle until toothed gear end snaps home up against left side; now comes the hardest part – insert spindle and try to find the hole inside platen into which it goes; this will take five minutes if you’re like me, so keep trying and be patient, it may seem impossible but eventually you will find that hole and slide it right in; reassemble screws and don’t forget to flip up the paper table before inserting the platen, or you’ll have to take it out again! And oh yes, the softer platen is much quieter than the old hard one. 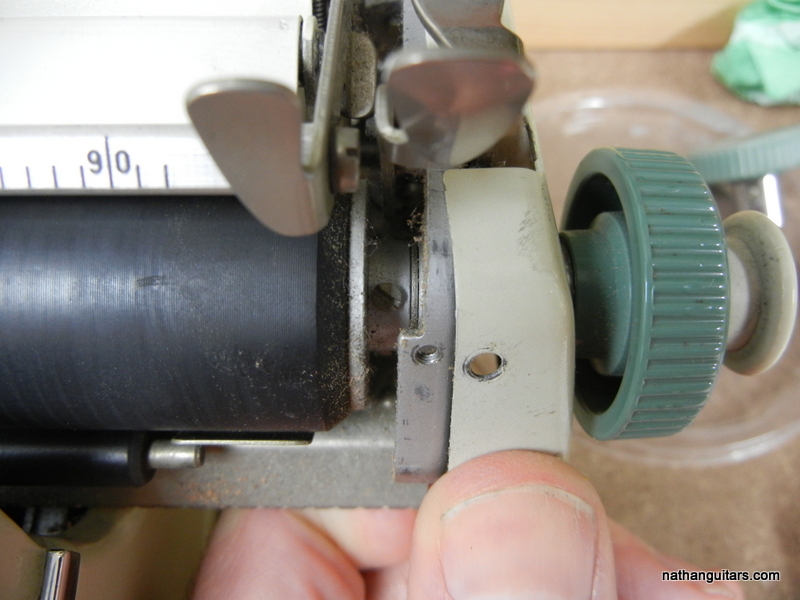 Next job – see if platen from SM9 Monica can be swapped with my SM3.